This year, there have been two slow-burn musical success stories on either side of the Atlantic. In the UK, Toby Marlow and Lucy Moss’ Six is a girl-power musical retelling of the story of Henry VIII’s wives; in the US, Joe Iconis’ musical Be More Chill, based on the novel by Ned Vizzini, asks its audience what would happen if popularity came in a pill? Six was first seen at the Edinburgh Fringe in 2017 at Sweet venues. This led to a four-performance run at the end of 2017 at London’s Arts Theatre, where it received fair-to-middling notices. Reworked, the show relaunched as a tryout at Norwich Playhouse and then for a run at Underbelly during the 2018 Edinburgh Fringe. It then headed back to the Arts Theatre where, this time, it scored rave reviews. As well as the creative work on the production, what happened in the intervening time was #MeToo. The show’s focus on gender equality made the timing of Six, performed by a talented girl group, both pertinent and topical. It found a young fan base, helped by the impressive work the cast has undertaken to publicise the production. This has included meeting fans post-show – affording them plenty of photo opportunities – that’s seen the show widely shared across social media. It has been a similar situation with Be More Chill, which started its life in 2015 at the the Two River Theater in New Jersey. The production played its run and released an album. It steadily built a young fan base who had listened to the recording. But the production itself received mixed reviews. In 2018, it was revisited in a revival Off-Broadway at Signature Theatre, where its fans sold it out. Again, it only scored a lukewarm review from the New York Times. Nonetheless, it still announced a Broadway transfer for February next year. Here is where the path of these two musicals diverges. Be More Chill chose to move to Broadway, making a leap from a 294-seat auditorium to a 950-seat one. Meanwhile, Six is returning to the 350-seat Off-West End Arts Theatre in January, avoiding the allure of a bigger West End house. 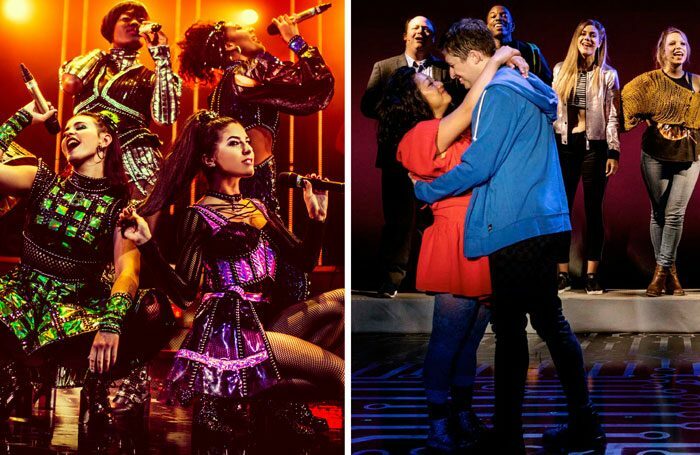 At the Arts, the show has a better chance of bedding in and sustaining an open-ended run at affordable ticket prices, together with onward international licensing, rather than risking it all on a main-stage West End transfer. In contrast, Be More Chill is looking to follow musicals such as Dear Evan Hansen and Avenue Q, which both moved from their Off-Broadway runs on to Broadway. Unlike Be More Chill, these shows achieved strong notices ahead of their transfers. As a result, they were able to attract broader audiences than their original fan base. Be More Chill is a more alternative musical. It will initially be reliant on its younger fan base and strong word-of-mouth to sell tickets. Its survival on Broadway will depend on whether there are enough of them who can afford top-dollar Broadway prices and are willing to keep coming back. This is not without risk. A successful production Off-Broadway does not necessarily translate into a long-running Broadway hit, as musicals such as Passing Strange and Fela! serve to demonstrate. Both were critically better received than Be More Chill. But what Be More Chill and Six have both found are loyal audiences. Their success can be attributed in a large part to social media – but it can also be considered akin to the model that producer Bill Kenwright successfully applied back in the late 1980s when producing Willy Russell’s musical Blood Brothers. Despite the original 1983 production winning the Olivier award for best musical, it was a modest success, playing for only six months. For many musicals, that might have been the end. But in 1987, Kenwright picked up the rights and revived it. He toured the show for more than a year throughout the UK. The consistency of touring helped it to grow a steady fan base, with repeat visits by audiences and full houses. As a result of its first West End outing, Russell had been left disillusioned over any return of the show to the West End. However, after much persuasion by Kenwright, he attended a regional performance and witnessed the audience’s reaction. He subsequently gave Kenwright permission to take his production back to the West End. The steady fan base of all ages that had been built up through touring and the careful creative steps taken in going back to revive the work helped to secure the musical a strong West End presence and one of the longest runs in West End history. Kenwright’s shepherding of Blood Brothers both in the UK, then subsequently for its Broadway transfer, is an example of the belief, determination and skill needed to be a successful producer. While social media may have helped Be More Chill and Six to develop an enviable presence, their success has ultimately been thanks to their producers’ dogged determination to get these shows on and build them an audience, using new tricks to deliver old and well-established lessons of producing.